Volvo is going all out to make its vehicles as safe and intuitive as possible with a slew of announcements about increasing safety tech in its vehicles. Shortly after announcing its plans of limiting the top speed of its vehicles from 2020, Volvo has taken another step in the same direction and announced that it’ll introduce in-car cameras to monitor the driver's condition and address the issues pertaining to intoxication and distraction. While speeding is one of the contributing factors in causing road fatalities around the globe, there's no doubt that DUI (Driving Under Influence) cases are steadily rising and are also a major road safety concern. Further, ever-increasing distractions due to growing dependence on gadgets are also proving to be silent killers these days. These three factors, in Volvo's opinion, constitute main ‘gaps’ in achieving its vision of a future with zero traffic fatalities, and, therefore, a focus on human behaviour in the company’s safety work is required. By installing in-car cameras and other sensors to monitor the driver's condition constantly, the recorded data can effectively allow the car to intervene in case a clearly intoxicated or distracted driver does not respond to warning signals and is at risk of being in an accident. Examples of such behaviour include a complete lack of steering input for extended periods of time, drivers with their eyes closed or off the road for extended periods of time, extreme weaving across lanes and excessively slow reaction times. The intervention could involve limiting the car’s speed, alerting the Volvo on Call assistance service or, as a final course of action, actively slowing down and safely parking the car. 'When it comes to safety, our aim is to avoid accidents altogether rather than limit the impact when an accident is imminent and unavoidable,' says Henrik Green, Senior Vice President, Research & Development at Volvo Cars. 'In this case, the cameras will monitor for behaviour that may lead to serious injury or death,' he added. 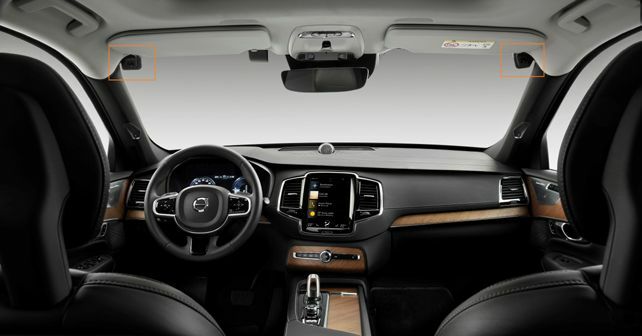 While still in its research phase, Volvo will introduce the in-car cameras on all its models from early 2020, with the next generation of Volvo’s scalable SPA2 vehicle platform.